Events Archive - Gavin's Got HeartGavin's Got Heart - Our mission is to spread congential heart defect (CHD) awareness while offering support to families with children affected by CHDs. 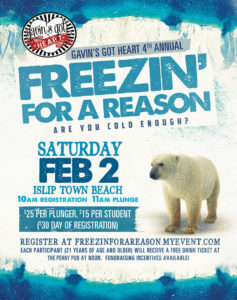 Join us for our 4th annual Freezin’ For a Reason polar plunge on Saturday, February 2nd at Islip Town Beach! Let’s kick off 2019 together and make a splash for GGH!